Located at the heart of Kuala Lumpur, Grand Millennium Hotel houses several restaurants for both the locals and foreigners. One of them is none other than Zing Restaurant. 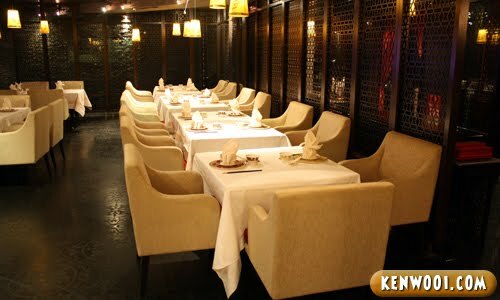 The restaurant’s interior emits a distinguish Chinese aura – from oriental decorations to traditional elements. Despite being known as an authentic Chinese restaurant, they have comfortable modern sofas too! Basically it was a food review invitation for a certain “deal”. What deal is that? Well, you gotta go through the menu first. 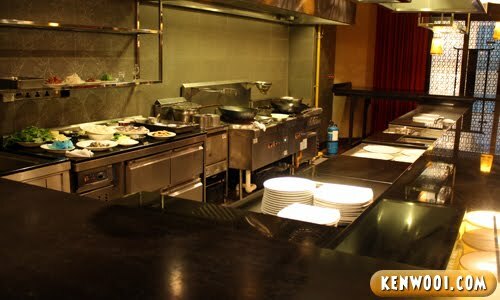 Anyway during the dining session, there is an open-kitchen where Zing’s chefs demonstrates their cooking skills in front of guests. While waiting for the Master Chef to start, the preparation for the appetizer dish started. 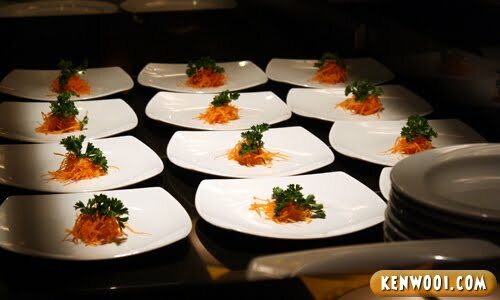 Plates were lined up, waiting to be decorated with other ingredients. When it was time, the chef started cooking while his assistants began to prepare the dishes. From an almost-empty plate, it became a masterpiece! And that’s when we started our dining session. 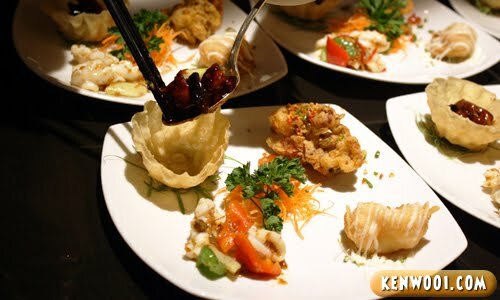 The appetizer consists of stir-fried kong pao diced chicken, stir-fried squid, salad wanton and deep fried soft shell crab. 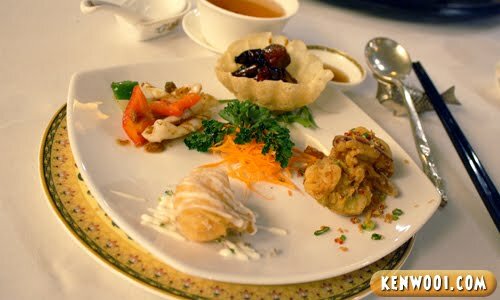 The selection of ingredients are great – tender chicken, succulent squid, loved the mayonnaised wanton and crunchy soft shell crab! Certainly got me anticipating for more. The next dish is Roasted Meat Platter. 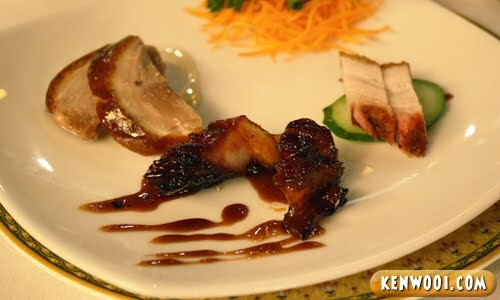 It consists of roasted duck, BBQ meat and roasted pork. One thing I like about this platter is that they don’t come with fatty fats – just pure meaty meat and crispy roasted skin. The Stewed Soon Hock Fish with Bean Puff comes next. 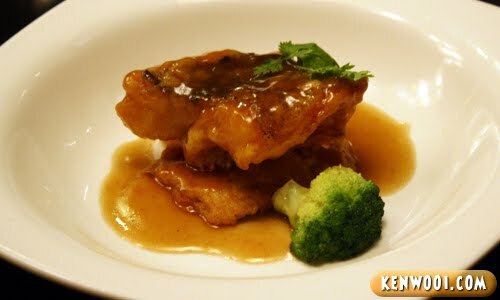 This almost-boneless fish seems like a fish fillet to me – just that it’s kinda wet, due to the sauce. Fourth on the menu is the Braised Homemade Bean Curd with Stir-Fried Scallop and Garden Greens. The bean curd is definitely coated with eggs – the combination produces a tasty tofu. Topped with a scallop, it becomes an even tastier dish. Next, the Stir-Fried Egg Noodles. 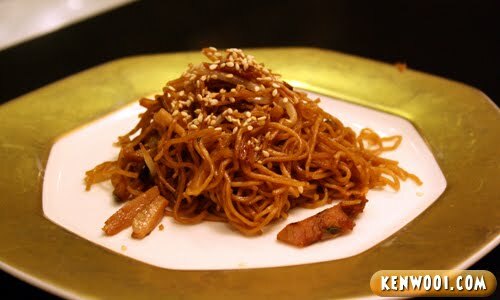 Mixed with shredded honey BBQ pork, it eliminates the plainness that some egg noodle has as there is an extra ingredient to munch on. Lastly, the Sweetened Potato Soup with Glutinous Rice Dumpling. 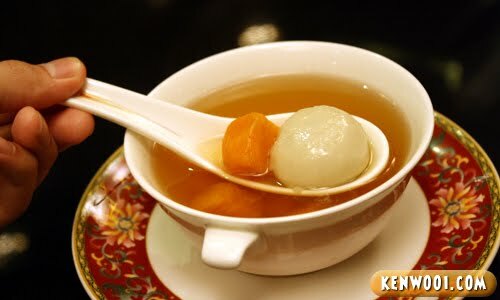 A typical Chinese dessert – but the glutinous rice ball accompaniment seems rare to me. The ginger taste could be strong, but still – it’s good. 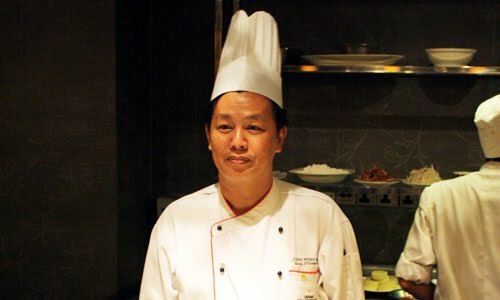 Gotta thank Master Chef Leong for the wonderful meal. 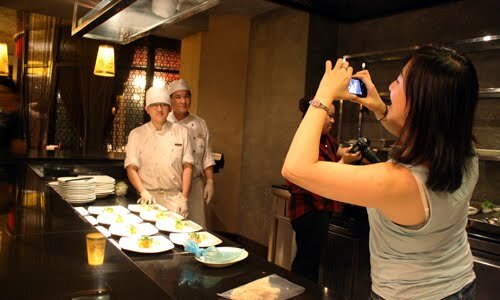 Overall, the dishes are delicious and know what, this 6 Course Meal is on Groupon Deal with just RM39 per person! Yes, this is THE deal mentioned earlier. 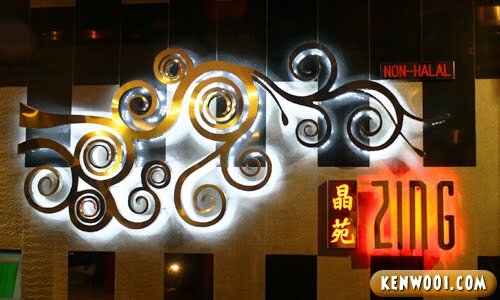 Good food at a classy restaurant at just under RM40? That’s really a good deal, only on Groupon! really a good deal!!! better get the voucher before it is sold out!!! So nice…over there! Can get great prices on such coupon deals. But RM39 per person isn’t that cheap – for a few ringgit more (or less even – depending on which hotel), can go for buffet dinner here. Chinese tapas, in a way. Delicious food! I see siew yoke. Yum! Nice pictures, Ken. So, how many of you were there? so this is from groupon! i read it this morning in my email.. wonder they give me discount?? hehee..
Braised Homemade Bean Curd with Stir-Fried Scallop and Garden Greens looks so nice…I am interested in that dessert as well. Yummy!! ow man…the food look superb! !